Master Sergeant Nicholas Oresko is a former U.S. Army soldier and a recipient of the U.S. military's highest award for valor, the Medal of Honor, for his actions in the Battle of the Bulge during World War II. 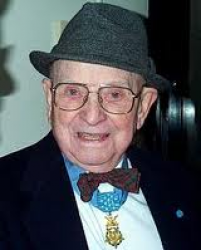 Following the death of Barney F. Hajiro in January 2011, Oresko became the oldest living Medal of Honor recipient. Nicholas Oresko was born on 18 January 1917 in Bayonne, NJ. 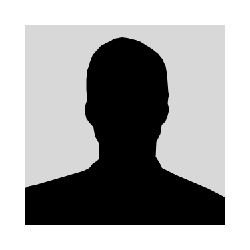 As a young man, he worked in the shipping department of Standard Oil of New Jersey. Only 5-foot-4 inches tall and weighing about 150 pounds, he joined the U.S. Army from that city in 1942. As a platoon leader in Company C, 302d Infantry, 94th Infantry Division, Oresko was sent to Europe and arrived in France in August 1944, two months after the D-day invasion. His unit spent the next several months mopping up pockets of German soldiers who had been bypassed in the Allies' initial push through the northern part of that country. In December 1944, they were redeployed in support of American units which had been forced to withdraw in the early days of the Battle of the Bulge, Hitler’s massive surprise attack that was inflicting heavy casualties as the Allies massed for a push toward Berlin. Oresko ordered his platoon to move forward. No one did. He repeated the order. Still, no one responded. “I said to myself, ‘Well, someone has to go,’ ” he remembered. “So I decided to go myself.” He had gone 30 feet up that hill when his men began moving out behind him, but the closest were still 50 feet away. In the chaos that followed, MSG Oresko charged alone through heavy snow toward German machine-gun bunkers with automatic weapons fire converging on him from two sides. He tossed a grenade into one bunker, then fired his rifle, killing 12 enemy soldiers. But fire from another machine gun wounded him in the hip and he lay bleeding, unseen by the Germans, who evidently thought they had killed him. He saw red, blue, and purple flame coming from the Germans’ automatic weapons aimed toward his men coming up in the rear. And then his helmet hit a booby trap wire, but the shrapnel flew over his head. He reached inside his jacket for his remaining grenades, only to find they had fallen out. He crawled back through the snow, found them, returned to that second bunker, destroyed it with a single grenade, then sprayed rifle fire once more, killing all the Germans inside. The hill now belonged to the Americans. 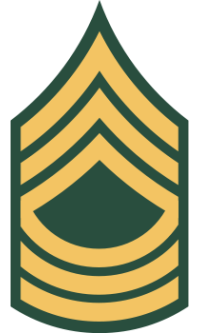 For his heroic actions that day, MSG Oresko was awarded the Medal of Honor. MSG Oresko was hospitalized for a month with his wounds and then assigned to supply duty. In late summer 1945 he was finally sent back to the United States. The Medal of Honor was formally presented to him by President Harry S. Truman during a ceremony at the White House on 12 October 1945. 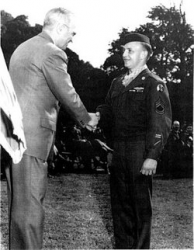 In November 1945, he rode in a parade held by Bayonne to welcome him home and stood in the reviewing stand alongside Lieutenant Stephen Gregg, another soldier from Bayonne who had also received the Medal of Honor. Bayonne School #14 was re-named in his honor in July 2010. Nicholas Oresko worked for the Department of Veterans Affairs until his retirement. Master Sergeant Nicholas Oresko died on 4 October 2013 at Englewood Hospital and Medical Center of complications following surgery for a broken right femur. It was the same leg that was wounded on 23 January 1945 as he crawled alone from one enemy machine gun bunker to another to take them out with grenades and his M-1 rifle. Oresko lived in Cresskill, NJ, at the time of his death. He is buried at George Washington Memorial Park in Paramus, NJ. President Harry S. Truman shaking hands after presentation of the Medal of Honor to Nicholas Oresko on 12 October 1945.